Original 2016 24 Hours of Le Mans Poster. June 18 and 19, 2016. Probably the most controversial 24 Heures du Mans of the last two decades! 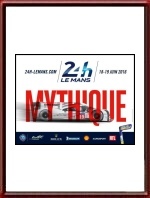 The 2016 Le Mans poster is part of the era in Le Mans posters which is generally described as "The Le Mans Poster in the era of computer graphics and sponsorship" and which lasts from 2001 until the current day. 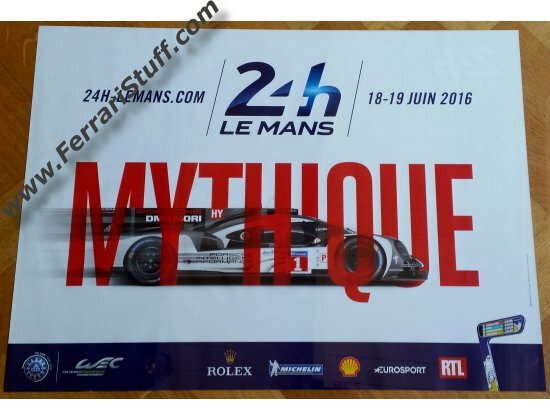 The 84th edition of the Le Mans 24 Hours is placed under the banner of the Myth of the 24 Hours and the poster leaves no questions about that! This time, the Automobile Club de l’Ouest collaborates with the Bronx communications agency while the photo of the Porsche 919 was provided by Porsche themselves. The event was, controversially, won by Romain Dumas, Neel Jani and Marc Lieb in their Number 2 Porsche 919 Hybrid. Ferrari raked-up the first three paces in class GTE Am with a 488 GTE and 2 458 Italia's. For the full results of this race, please see 24 Heures du Mans results 2016.